pQCT, used for the analysis of muscle and bone, Leonardo mechanography, used for motion analysis and muscle diagnosis, and Galileo Therapy are the building blocks of a holistic diagnosis and therapy concept focusing on muscle and bone. Diseases of the musculo-skeletal system are among the most common causes of immobility and frailty, independent of age. The loss of muscle function is often associated with increased dependency or loss of autonomy, with osteoporosis or other consequential diseases. Weak muscles cause an increased risk of falls and, therefore, an increased risk of fractures. In addition, the loss of muscle force results in a reduction of bone mass (osteopenia or so-called secondary osteoporosis). These risks can be avoided through early diagnosis of muscular problems in combination with a meaningful therapy. Since there is a close correlation between muscle function and bone parameter, it is crucial to have a meaningful diagnosis to assess them. A diagnosis of bone alone, without considering muscle characteristics, can not clearly distinguish between a rare, primary bone disease and a more frequent lack of muscle function as a cause for low bone strength. On the other hand, understanding the relationship between muscle and bone is essential for an effective training program tailored to the individual needs of the trainee. Our products are based around this concept in both the diagnostic and therapeutic sector as well as in the training area. From the very beginning, both Novotec Medical and Stratec Medizintechnik have been committed to international research. For us it is essential to make our expertise easily accessible to our users by means of training. Hence, the latest research results quickly find their way into application. Leonardo mechanography allows the identification and assessment of individual muscle function in objective physical quantities such as force, energy, power and rigidity. The most important bone and muscle parameters are recorded using pQCT. Besides the physical material density of bone geometric parameters such as cortical thickness, cross-sectional area and trabecular apparent density are measured allowing a very precise determination of bone strength. In addition the muscle cross-sectional area and muscle density are determined by the pQCT measurements. By comparing the cross-sectional areas of muscle and bone, secondary osteoporosis (Osteopenia) can be distinguished from a primary disease (‘true' osteoporosis). This analysis of the musculo-skeletal system is further optimised by considering the actual muscle function, in this case, the actual maximum voluntary muscle force instead of a surrogate parameter like the muscle cross section. These muscle function parameters can be quickly and easily recorded by Leonardo mechanography. The combination of Leonardo mechanography and pQCT thus enables a new, comprehensive analysis and diagnosis of the musculo-skeletal system. 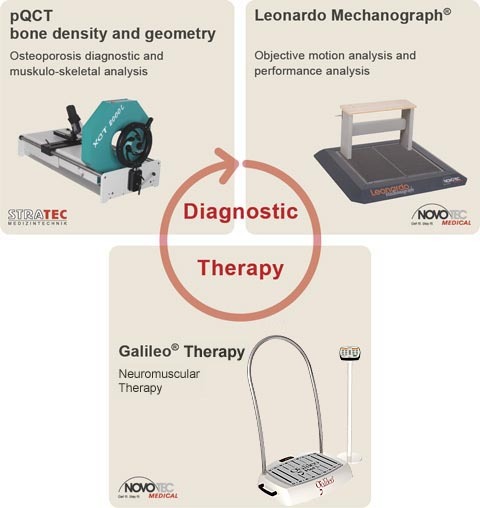 Galileo Therapy enables the successful treatment of musculo-skeletal disorders diagnosed, for example, using pQCT and Leonardo mechanography. Both diagnostic systems, especially the Leonardo Mechanography, are well suited to objectify and to document treatment results - a measure that also gains increasing importance in the context of a modern quality assurance in the therapeutic and medical field.